Image copyright The Open University. The Open University (OU) has taught more than two million students since it was granted a royal charter on 23 April 1969. Lectures were first broadcast on 3 January 1971 on BBC Two, and course materials - including entire science experiment kits and even the brains of sheep - were sent through the post. One programme, shown in 1979, featured the famous Foucault experiment, which proved the earth rotates, by hanging a brass ball from the roof of St Paul's Cathedral in London. The final OU programme was broadcast in 2006, by which time most of its content had moved to DVD and the internet. 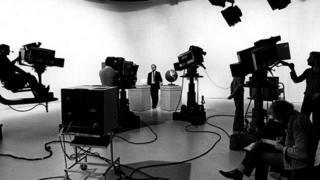 More than 40 clips and full programmes from the past 50 years are available to view on the university's digital archive. The Open University came about under Prime Minister Harold Wilson, who said he had been working on the idea before becoming leader of the Labour Party in 1963. The first degree ceremony was held at Alexandra Palace in London 10 years later, on 23 June 1973. Wilson's arts minister Jennie Lee was instrumental in setting up the OU, and met the Queen on campus in Milton Keynes in 1979. The new town was just two years old when the university was created and was chosen as its main headquarters because it had ample space and was relatively close to London. The university has almost 175,000 current students, including more than 7,000 overseas. Tracy Thorpe, 51, studied for her modern languages degree while working as a professional crew on yachts. She features in a new set of photos by photographer Chris Floyd to mark the university's 50th anniversary.